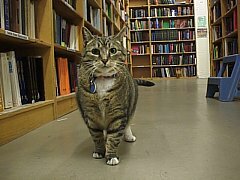 Fup lives at Powell's Technical Bookstore in Portland, Oregon. She was adopted from a shelter when she was a kitten in 1988. 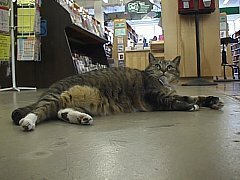 She has been there as long as the store has! 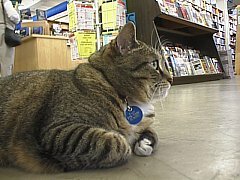 Her main duties are to walk around and keep an eye on things, and to act as a paperweight. Her favorite places are in boxes of any size. 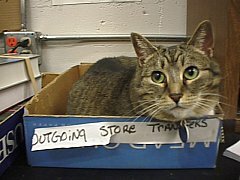 She usually naps in the fax paper box, but we caught her jumping in the "Outgoing Store Transfers" box. She likes to be petted, but only for so long. Then she'll turn around and whack you one! Note: Fup passed away on October 25, 2007. She had admirers and friends all over the world. She will be missed by all who knew her. Here is a tribute to her.